Refresh your mind, body, and spirit: Enjoy a personal retreat or sojourn. Host your community event with us: Experience radical hospitality. Gain valuable and inspiring Quaker insights: Subscribe to our pamphlet series. 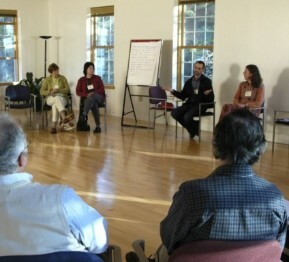 Discern, shape, and absorb: Attend a conference, lecture, or seasonal workshop. Transform lives: Create peace with justice in the world. Located on 24 tranquil acres in the heart of a Quaker community, Pendle Hill offers a relaxing “world apart,” yet is within easy reach by car, plane, bus, or train. Our vision, “to create peace with justice in the world by transforming lives,” is moved forward in worship, presentations, weekend workshops and retreats, short courses, and remarkable conversations. Discover what we offer. We look forward to welcoming you soon. At the Quaker Institute, Friends will come away with renewed energy, deep insights, and practical skills and experience that can deepen Quaker practice in their meeting community. Join us, May 30-June 2, 2019.